The Woonsocket School Board is planning to approve a lower opt-out amount at their next regular meeting on Sept. 9 in the city/school library. The current local general fund opt-out is at $250,000 and the recommendation is to reduce it to $175,000 (for the taxes payable in calendar year 2014). Several things have occurred recently that have changed the financial climate that the District is facing. • We have enrolled several new students and a 25 count kindergarten class, which will increase our state revenue. • Health insurance rates have gone down to 2.3 percent instead of the double digit increases we have been receiving in past years. • We have several new teachers that have replaced higher salary veteran teachers and we also have continued or added sharing staff with other school district(s). When we approved the $250,000 opt-out in 2012, the board approved to reduce the capital outlay levy by 50 cents per $1,000 of valuation, and the special education levy by 40 cents per $1000 of valuation. The maximum capital outlay levy is $3.00 per $1,000 and we are currently at $2.00. The maximum special education levy is $1.55 and we are currently at $1.00. The board has options to raise the levies each year and also the authority to request any amount up to the full $250,000 until the opt-out expires or is renewed. The board plans to maintain the current levies as is. I believe the proactive community efforts by improving recreation, streets, clean-ups and the positive school education we provide is ensuring Woonsocket a positive future. We appreciate the fact that our community ranks education as a top priority for our youth allowing us to continue the productive education our small school can provide. Please don’t hesitate to call me or the school’s business manager, Chris Selland, with any questions or concerns at 796-4431. The Woonsocket Fire Department was called out to a tractor and baler fire in a hayfield on 397th Avenue north of Woonsocket Monday afternoon. The equipment and field is owned by Amick, Inc.
Firemen were called to the fire around 3 p.m. Temps in the upper 80s and high humidity made the task that much more uncomfortable for the responders. 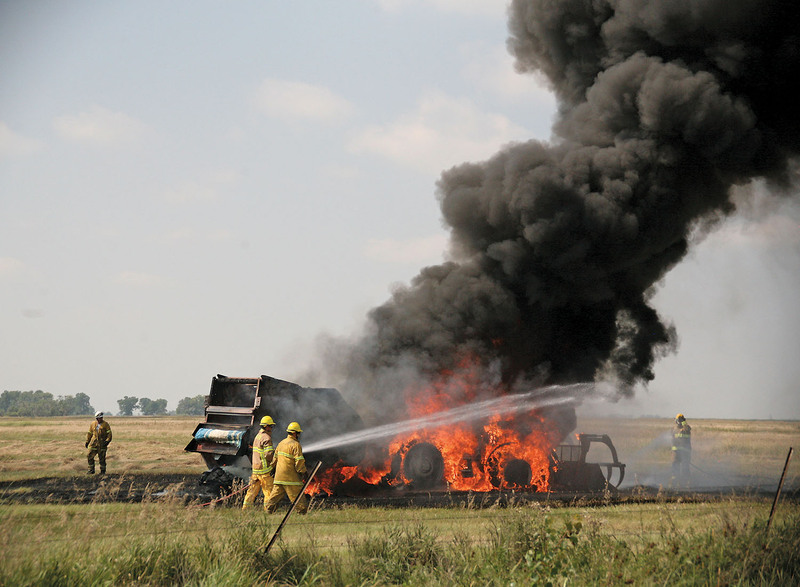 The tractor and baler were both a total loss, but the fire was kept from spreading. 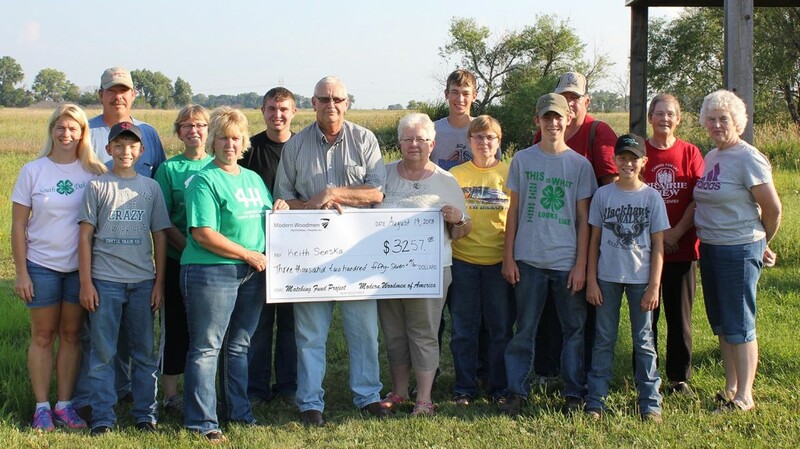 Pictured above are Modern Woodmen and 4-H leaders and members presenting Keith and Barb Senska with a check from Modern Woodmen of America for $3,257 which includes $1,000 in matching funds. Pictured in back: Paula and Henry Linke, Janet Maeschen, Riley Zoss, Jonathan Linke, R.L. and April Larson and Pat Larson; front row: Nathan Linke, Stacy Zoss, Keith and Barb Senska, Jeanette Luthi and Aaron and Megan Linke. Modern Woodmen of America members in Woonsocket recently teamed up with Sanborn County 4-H and the Town ‘N Kountry Kids 4-H Club to help raise money for Keith Senska with a pie social and auction. The event, held during Sanborn County 4-H Achievement Days on Aug. 3 raised $3,257. This includes $1,000 matched by Modern Woodmen’s home office through the organization’s Matching Fund Program. The money will be used for medical expenses incurred in his successful battle with tongue cancer. The Matching Fund Program offers Modern Woodmen members nationwide the chance to show their support for a community cause, organization or individual in need by holding fundraisers. Modern Woodmen matches money raised up to $2,500. These fundraising projects contribute $9 million to community needs nationwide each year. For more information or to get involved, contact Malde at (605) 236-5611 or stacey.malde@mwarep.org. As a tax-exempt fraternal benefit society, Modern Woodmen sells life insurance, annuity and investment products not to benefit stockholders but to improve quality of life for our members, their families and their communities. This is accomplished through social, charitable and volunteer activities. Annually, Modern Woodmen and its members provide nearly $29 million and 1 million volunteer hours for community projects nationwide.fundraisers. Modern Woodmen matches money raised up to $2,500. These fundraising projects contribute $9 million to community needs nationwide each year.